Dogs age much faster than we do and don’t live as long as us but they can still suffer many of the same effects of getting older. Just like with humans, as they age dogs become more susceptible to disease, infections, and ongoing health issues. As dogs age they will slow down, snooze more, and show other signs of aging. Once they are past the first few years, different size dogs will age at different rates. Larger dogs tend to age faster than smaller do. Check out this dog age chart to see how old your dog is in human years. Caring for an older dog is different than caring for a puppy or an adult dog. Their needs are different in everything from food, exercise, and health care. Let’s take a look at some of the signs of an aging dog, and how to tell the difference between normal aging and serious health conditions. Different breeds of dogs are prone to potential health problems, and you should be aware of any potential health issues your dog may be genetically susceptible to. There are some common issues that face all senior dogs as they get old. So what kind of signs should you be looking for in your dog to be able to tell if they are aging? Let’s take a look at some of the common ones. Slowing down is a common sign of aging in dogs. You will notice a decrease in the amount of activity your dog does during the day. Your dog will start to slow down on walks and during play. You may notice a loss of agility, a decrease in playfulness, and lethargy. This can manifest as a little stiffness when standing and walking, or struggling to get up onto beds and couches and into the car. You may find your dog licking joints and limping more often. These signs can indicate joint pain and arthritis so make sure to take your dog to the vet for a checkup. Your dog’s weight may fluctuate once they start to age. This is often a result of reduced activity and slowing down. Most often it will be an increase in weight, particularly if you don’t alter your dog’s diet to account for the reduced activity. It is important to note that overweight dogs are at a higher risk of developing diseases such as diabetes, heart disease, and cancer. Aging dogs can also lose weight, and this could be a sign of a decreased appetite, illness, or disease. A loss of appetite can be another sign of an aging dog. Your dog’s nutritional needs change as they age so make sure you monitor your dog and adjust their diet accordingly. Decreased appetite can also indicate poor digestion and digestive issues as well. We will go over some ideas of what to feed your senior dog soon. Some of the most common signs of aging in dogs are changes in their physical appearance. Just like with us, their hair can start to turn grey particularly around the nose and eye areas. They may also be more susceptible to skin conditions like rashes, dry skin, swelling, lumps, and hair loss. Changes to hair and skin color are normal as your dog ages, but for more serious skin issues like lumps and rashes you should get those checked by your vet. Older dogs are particularly prone to dental disease, so some signs of aging can include bad breath, gum inflammation and bleeding, difficulty chewing, pawing at the mouth, and loose teeth. Dental disease is a common problem and it is estimated that 80% of dogs will have some type of dental disease by age two. Periodontal disease in dogs can lead to more serious health issues if left untreated, like infections in the liver, kidney, and heart, damage to the jawbone and connective tissue. Dogs can lose bowel control and toilet training as they age. If your dog is occasionally peeing where he’s not supposed to it could be a sign of aging. If it is ongoing or more serious this could indicate a health issue. Senior dog incontinence can be an indication of urinary tract infection or kidney disease. Dogs can suffer from hearing loss just like humans do. This will show as things like your dog may not respond to you as quickly as before, not coming when called, and ignoring your commands. Your dog’s vision can deteriorate as they age as well. This means they may have trouble seeing furniture in the house or difficulties playing games like fetch and catch. It could also show as bumping into things more than usual or as physical symptoms like cloudy eyes. Cataracts and other eye diseases can affect dogs as they age. Other signs your dog is aging include changes in behavior or mental problems. Look for indicators like disorientation, irritability, confusion, or any change in personality. Your dog may become less interested in human interaction or you may notice a change in their sleeping patterns. They can suffer from increased separation anxiety, memory loss, or have less interest in play and exercise than normal. So you may have noticed some of these signs in your aging dog and want to know what you can do to help them. First you should get any concerns you have checked out with your vet to rule out any serious health conditions. Once you know that they are simply signs of your dog getting older you can try to help. Most of what you can do to help your dog with aging is to make them comfortable and give them lots of love and attention. Easing their pain and suffering will make their life more comfortable. If your dog is carrying excess weight can put additional stress on joints and cause more pain than necessary. Encourage your dog to keep moving as they age. Continue with regular walks and exercise, but you may need to make your sessions shorter. Don’t forget to adjust their calorie intake to account for their slower lifestyle. Make sure your dog’s diet is nutrient rich and full of good protein sources with highly digestible forms of fats, omega-3 fatty acids and antioxidants. High fiber is good for digestion which becomes more important as your dog ages. Reduce the amount of food you give your dog as their mobility and exercise decreases. You can also add in some supplements for senior dogs to help give your dog the best nutruition for their health. As a dog ages they will become less agile and motivated to exercise and play. You will want to reduce and eventually avoid high impact, twisting and turning activities like frisbee and chasing balls. Stick to moderate, low impact exercise like slow walking. Continue to give your dog the best health care you can. Take your dog to the vet if you notice any signs of health problems or changes in behavior. More regular vet visits will help to catch any health issues before they become too advanced. Keep your dog healthy and happy as they age. It is not true that you can’t teach an old dog new tricks. It is good for their mental health to continue to learn new things and be exposed to new environments. 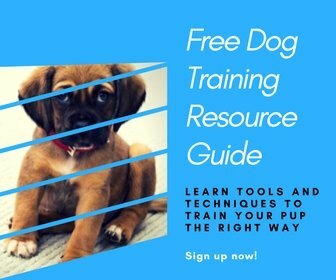 Try to continue to teach your dog new things and reinforce existing training with regular sessions. You may just need to shorten the sessions for your aging dog to prevent tiring them out. Mental stimulation is important to help prevent cognitive issues that come with age like dementia and alzheimer’s. Watch for the signs of aging in your dog and do what you can to help them live a long, healthy, and happy life. Recommended Reading: Holistic Medicine For Dogs – Can It Really Help Your Dog? P.S. Help a friend with caring for their senior dog by pinning this!